Another OOTD for you today! After uploading one a few weeks back and seeing all your lovely comments and tweets I decided that really it wasn't that scary after all! I love that the sun has been out lots recently - summer finally feels like it might be on the way and I finally have an excuse to wear BRIGHT colours! And what else comes with bright clothing? Bright make-up! I love an excuse to get out bright lip colours ... and this is one of the brightest I own! 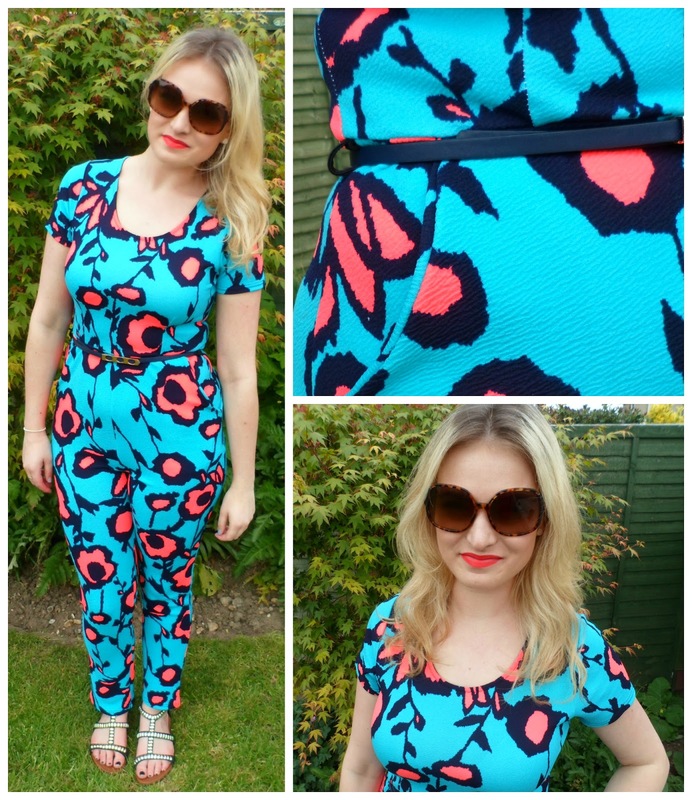 I am loving jumpsuits at the moment and this one is perfect for summer! I love the bright colours and it is so comfortable - I have other jumpsuits that I literally cannot even sit down in because of the way that they are made but this great! A lovely material too! I'm so glad I can get my favourite sunglasses out aswell - I know they are big...but I have a big forehead so big sunglasses are a must! Have you got your bright clothing out yet?! So so nice.. Love those colours. I can't wait for the weather to brighten up so I can wear summery bright clothes!! I just love that shade of blue! Beautiful girly! Perfect outfit for this time of year!